Just made Level 11 inactive and getting the same problem so 4 weeks of work will have to be redone! The dropdown menu only had non-contract as an option, nothing else. Anyway, it was like that for a few weeks of close season then part-timers started asking for improved part-time contracts and then those youths asked for part-time contracts too. Weird, but all is normal now. Let me not clog up the thread when Dan needs to figure out his complex problem! With regards to Mile Oak - the stadium (Chalky Road) doesn't seem to have a long/lat set - perhaps this is inadvertently throwing things out? I can't remember if the code uses the long/lat of the city, the stadium or both when deciding appropriate leagues. 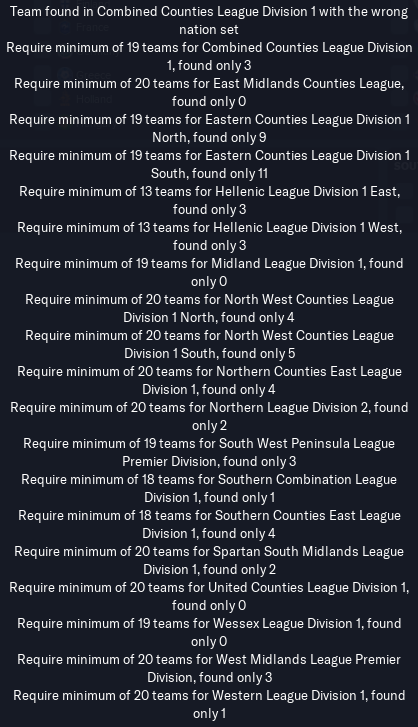 As a separate issue - has anyone noticed that league histories for clubs are very erratic - some clubs have full histories, some partial, some none at all (which I think are the L10 leagues) - any idea if there is a flag or something I'm missing? Don't recall similar issue last year. It's that it's from a start game not even simulated to the next season promotions that make me think it can't be the long/lats of stadiums and must be even more fundamental. I've tried a few edits on your L11 Dan and am still getting the same results even with adding to the reserve team list and removing from the main list. It makes no sense as the test goes through fine! New starts done the last two times SWP doesn't actually seem to form a league, it says that the league is yet to be scheduled where other L11 leagues are scheduled. Mile Oak do seem to be in the right league now though. Just done a new start, view only Dan's L11 and 1 French league. The previously mentioned teams (Calne, Alton, Mile Oak) seem to now be in the right leagues. However there is an issue with the SWP as it's not being scheduled. 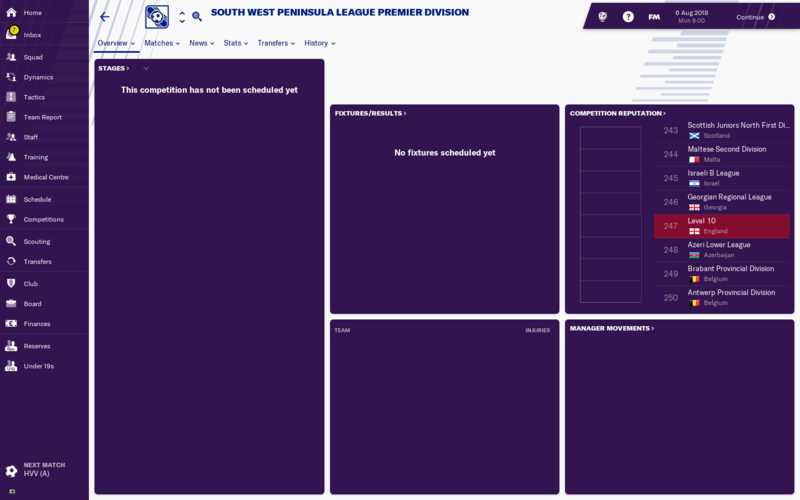 I don't have an in depth enough knowledge to properly investigate but I am looking for leagues that contain a reserve side to see if they're also not scheduled. I'm now trying the L11 database with the start date missing pre season just to make sure that's not what's causing the issue for SWP but it's still not scheduled the league at all but other L10/11s do seem to work. In some ways - positive! It is the exact same file that was having specific issues before so very strange. 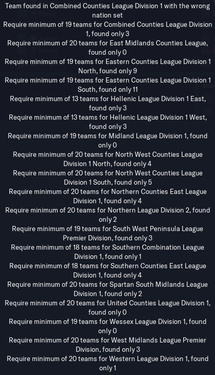 If anybody wants to list off reserve teams in lower leagues and I can spot check to see if this is the consistent error as it now seems to be the only one I can see. @Dan BHTFC - Wythenshawe Amateur in North West Counties Division One South should be Wythenshawe Amateurs (plural). Wythenshawe Town. They also play at Hollyhedge Park, not Valley Road. That's what I said it doesn't make sense, all I've done is added Level 11 to that Level 10 database! Re-doing Level 11, will be doing a test load up everytime I create a league! Given that the database tests fine is it not then what you were saying re reserve teams? If you have them listed for each league as reserve teams rather than as part of the main league team list. Wouldn't want you to recreate it all to get the same result as will you not just be doing exactly the same thing you already have again? Have you tried it without merging - If you were to just add on to the existing L10 editor data? 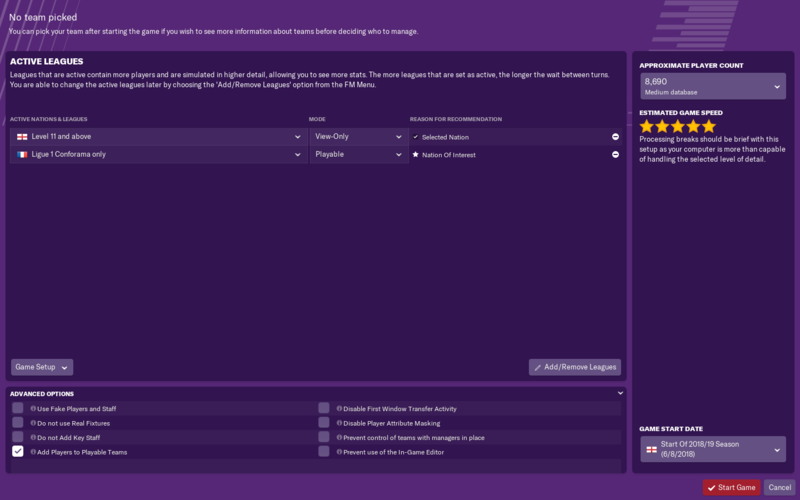 I have tried moving the reserve teams this way by editing your database and it doesn't seem to change anything but I'm sure there's something I'm missing. I only ever normally edit teams! Its not impossible to do average points per game, that's how the winners of the playoffs in level 8 are determined, 5 from 7 teams promoted on average point per game. So only for now level 10 is available to play? great work dan, keep the effort going! i've been reading through the forum and i can see level 10 is ready now is this with the cups installed as well? Has anyone got the link for this file so i can download it please? It's in the 2nd post, back on page one. Dan updates as he goes. are you still accepting league requests? Nice to see this being done again for this year! Is there any ETA on the release of level 11 with cups? Looking to start a new save with this. Sorry for the lack of updates from myself, Christmas was busy for me so haven't been able to do any editing for around a week, have been working on it today though, I've decided to restart Level 11 and seeing if it works this time. I did although probably ate and drunk far too much!! I've been running a career with Little Oakley using Dan's L10 file. It's all gone a bit 'meta'. 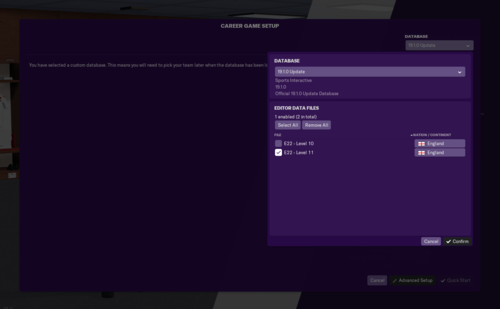 My thread narrating the save in the FM Career Updates forum has turned into a spooky meta-narrative as the club and players have discovered it and have been commenting on my Twitter feed. 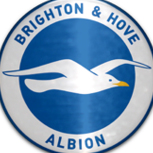 To your knowledge has it happened before that the real club and players you are managing in a fictional world have intruded into it? I﻿'ve been running a career with Little Oakley using Dan's L10 file. It's all gone a bit 'meta'. My thread narrating the save in the FM Career Updates forum has turned into a spooky meta-narrative as the club and players have discovered it and have been commenting on my Twitter feed. To your knowledge has it happened before that the real club and players you are managing in a fictional world have intruded into it? Well it's a bit awkward. I used the pre-game editor to put the real-life players in the squad (and make their CAs all under 10 which, if you watch the youtube, was quite accurate), but the editor AI put them in the wrong positions, which is what some complained about. I hope they didn't go into the thread because I got rid of most of them in the first year and my 15-16 year-old academy recruits were far better than all of them! Halfway through Level 11 (again) just completed the South West Peninsular Division 1 East and West and everything is fine when loading up the game. 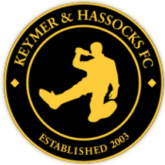 Can you let me know how you're getting on with the Kent County Premier Division, if you need any help with that please give me a shout. Keen to start a new save when it's up and running. 24 level 11 divisions done, not many more to go! all working fine so far? All working fine at the moment! 34 playable leagues at Level 11, going to add a couple more then it's time to add the FA Vase and some League Cups then the fun of Level 12 and below begins! Any chance of the West Yorkshire and West Riding Amateur League being at level 11?? Which leagues have you got the Northern Counties feeding to Dan? 13 Sheffield & Hallamshire County Senior Football League Division Two. Yes, that would work, I have noted that both Central Midlands North and the Nottinghamshire Senior League feed into the East Midland Counties wereas Sheffield & Hallamshire onlt go into the Northern Counties East. Have a good evening at work, thanks Dan. Having looked further, I would say the West Riding Amateur League could be ignored but the West Yorkshire Premier League could be added at level 11 with no promotion and adding the 2 lower divisions. It's not much fun managing a team to level 11 and unable to go further, or is that just me? If you want to go from top to bottom with a single team, then totally agree, but if you want to build up as a journeyman, then it would be nice to play as teams from my area. Yeah, that's fair enough. What I'd prefer, even if not strictly authentic, is for all leagues to be part of a pyramid so that whichever club you take at whichever level, there is a route to the top.